A father-and-son government-contracting team from Carlsbad pleaded guilty Thursday to securing federal contracts worth more than $4 million via false financial statements and other lies. 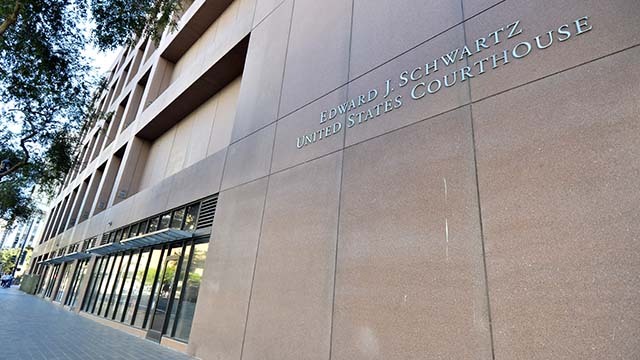 Joseph Glenn Osborne, 68, admitted in federal court in San Diego to participating in a wire-fraud conspiracy with his 31-year-old namesake son, while Joseph Glenn Osborne II pleaded guilty to fraudulently obtaining taxpayer money. During a hearing before U.S. Magistrate Judge Barbara Lynn Major, the elder Osborne, a longtime government-contracting consultant, also admitted to stealing more than half a million dollars from his consulting clients. Instead of faithfully representing his clients in obtaining and fulfilling contracts with the U.S. Department of Agriculture, Osborne Sr. altered their banking information in an online federal system so that when the USDA paid on their contracts, the money went to him instead of them, according to prosecutors. Osborne Sr. also admitted to lying to his clients when they questioned the missing payments. When one pressed him to take part in a conference call to explain where the money was, the defendant repeatedly and falsely claimed that he could not do so because he had been seated on a jury in a multiple-murder trial. According to his plea agreement, Osborne Sr. used some of the stolen money to put a down payment on a $2.7-million mansion in Rancho Santa Fe. He also forged emails to conceal the source of the funds by contending that it was an early retirement withdrawal from a benefits account at an agency for which he had never worked. In 2013, after the elder Osborne was terminated by his clients, he and his son agreed to submit fraudulent financial statements to qualify Osborne Jr.’s new business, Worldwide Connect LLC, as an approved USDA contractor. As set out in their guilty pleas, the Osbornes recruited a bookkeeper friend of the younger Osborne to prepare false financial statements that substantially overstated the financial health of Worldwide Connect. The documents, for example, fraudulently converted WWC’s 2013 year-end cash position from a $5,546 deficit to a $37,954 surplus. The Osbornes also admitted to falsely certifying to the USDA that none of WWC’s principals had been suspended or debarred from federal contracting. In fact, both outcomes had befallen the elder Osborne from November 2013 to October 2016 for conduct associated with his prior business, Global Health & Safety. As a result of the illicit submissions, WWC was approved for federal contracting and won over $4 million worth of USDA food-supply contracts. Four of the five contracts wound up terminated for contractor default after WWC failed to deliver over 100,000 cases of fruit juice and raisins to community food banks and lunch programs. The Osbornes admitted that WWC caused its suppliers and financing company over $1.5 million in losses. Meanwhile, the Osbornes paid themselves roughly $285,000 in WWC funds over a little more than a year, according to the U.S. Attorney’s Office in San Diego. The defendants also used other company money for personal expenses — including almost $10,000 for nightclub charges and luxury hotel stays, and more $9,000 for new flooring in Osborne Sr.’s home. After their contracts were terminated, the Osbornes applied to the Small Business Administration to be re-admitted to federal contracting, court documents state. As part of that process, Osborne Jr. misstated his father’s military history, telling the SBA Osborne Sr. was a retired Marine Corps colonel, when in fact he had retired as a first lieutenant. The younger Osborne also supplied a variety of falsified tax returns to the SBA for himself and WWC, including an altered tax return that converted his real $14,870 tax liability into a fake $5,427 tax overpayment, according to prosecutors. As part of their pleas, the defendants agreed to pay restitution to their victims in the amounts of about $1.7 million for Osborne Sr. and $1.5 million for his son. The defendants are scheduled to be sentenced May 7.